I thought long and hard on which New York City Starbucks I would visit on Christmas Day. In the end, I decided no Starbucks is more fitting than the one in Harlem on the corner of 125th & Lenox Ave — aka Malcolm X Blvd. We can only succeed as a store when we succeed as a community. We are together in this — and so we are proud to share the profits of this Starbucks store directly with Abyssinian Development Corporation to support its work with the children and families of Harlem. To achieve its mission, Abyssinian Development Corporation provides economic revitalization, housing, social services, eduction and civic engagement in Harlem and beyond. Now, I’m not a corporate social responsibility expert, but I think that’s pretty darn amazing. Not only is it doing good, but it’s doing good at a local level. The more the neighborhood drinks Starbucks, the more it benefits. It’s kind of genius. And very much a representation of what the holiday season and Christmas is supposed to be all about. The Philanthropy… The profits made from this Starbucks are shared directly with the Abyssinian Development Corporation, which provides social services to the Harlem Community. 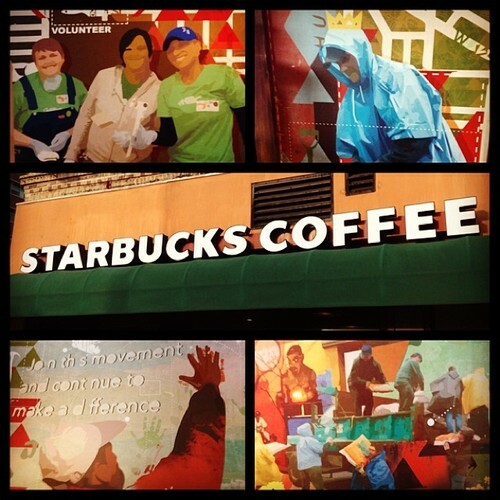 The Decor… Pictured above is wall art that depicts a map of Harlem alongside representations of the good deeds done by Starbucks and the ADC volunteers. The Size… A very small corner store. The Seating… Just four high bar stools up against the two exterior walls. The Restroom… None for public use. Bonus points for being very friendly when having to work on Christmas Day. A Starbucks Community Store in Harlem. From a philanthropic standpoint it deserves a 5-Cup rating, but unfortunately the Starbucks itself is not too accommodating.